Stetson Law at the National Mediator Competition: students Jenna Jordan, Haviland Kebler and Professor Erika McArdle. 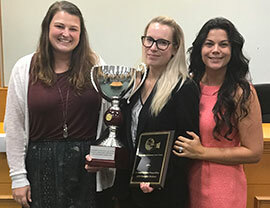 Stetson University College of Law’s Dispute Resolution Board continues to, well, show its resolve by winning major competitions during October and November. On Nov. 4, the board won the William & Mary Law School Negotiation Tournament for the third consecutive year, with Stetson law students George Hiller and Valeria Villaverde claiming the victory. Villaverde also was named Best Overall Advocate. Stetson sent three teams to the competition. Professor James Sheehan and alumnus Bill Greiner accompanied the students and coached. “This speaks to the quality of our advocates and coaches and the selfless dedication they have to Stetson and the [Dispute Resolution] board,” commented Professor Erika McArdle, associate director for Stetson’s Center for Excellence in Advocacy. On Oct. 13 , the Dispute Resolution Board team of Jenna Jordan and Haviland Kebler competed in the National Mediator Competition at the University of Houston Law Center — and Kebler won. A total of 16 students from teams across the country competed in the unique competition, in which law students serve and are judged on their effectiveness as mediators. Stetson’s students were coached by Professor Kelly Feeley.